Are you searching for the latest information about Nnamdi Azikiwe university, Awka. unizik post utme screening excise for 2019/2020 academic session? Then this post is for you as we are going to discuss everything you need to successfully apply for this year academic session. 1.4 What are the courses offered in Unizik? 1.7 How to apply to unizik post utme screening excise for 2019/2020 academic session? 3.1 When was Unizik founded? 3.2 Is Unizik a federal school? Nnamdi Azikiwe university, Awka – also known as unizik – is one of Nigeria’s federal owned universities. unizik always conduct her post utme screening excise in order to select the best candidates from thousands of aspirants that applied to unizik as their choice of institution. There are requirements each aspirants must meet before they will be allowed to sit for UNIZIK post utme screening excise for 2019/2020 academic session. We will discuss this requirement below. Every aspirants of UNIZIK must have sat for the 2019/2020 Jamb cbt examination and must have scored a minimum of 180, aspirants should know that they must have at least 5 required credits in relevant O/level subjects including English Language and Mathematics. Candidates who applied for admission into the University in the 2019 Unified Tertiary Matriculation Examinations (UTME)JAMB. Scored a minimum of 180 marks in the 2019 UTME for all courses. Obtained at least five (5) credit passes at GCE O/L, SSCE, NECO, or their equivalent. The subjects must include English Language, and Mathematics (for courses for which a credit in mathematics is required) as well as three other relevant subjects at not more than two sittings. Please be informed that at the time of writing this article unizik has not released her Post-UTME cut-off mark for 2019/2020 academic session, although the 2018/2019 post Utme cut off mark was 180, so expect anything around this mark. What are the courses offered in Unizik? Please note that at the time of writing this article unizik has not released the date of her post utme screening excise however Post-UTME date are usually fixed by the university Senate when the Post-UTME form is out. This is to inform you all that post utme form won’t exceed the usual 2500 naira set by the ministry of education,note that 2000 is usually for the post UTME form while 500 is for bank charges , how ever we will inform you the actual price when it is released by the school management. How to apply to unizik post utme screening excise for 2019/2020 academic session? You might be a little bit confuse about unizik post utme screening application process as you have not done this before how ever note that all application is done online and applications forms are usually sold in the school or banks located in the school premises and at times at banks outside the school’s premises. You are expected to bring Two (2) copies of your online registration forms which must clearly show your photographs. You are expected to bring your Baptismal Card or Certificate of Birth Registration or a sworn affidavit. You should also bring along with you, your Local Government Identification Certificate. Nnamdi Azikiwe University was once known and called ASUTECH although right now all that is now in the good book of history. 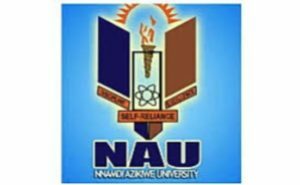 The Nnamdi Azikiwe University is one of the highly respected and top rated institution in Nigeria, it is often said in some quarters that after UNILORIN, UNIBEN, ABU, UNN the next most highly sought-after university is UNIZIK. As at 2017 over 62 thousand candidates struggled to gain admission into the Nnamdi Azikiwe University. The statistics of 2017 also shows that quite a number of candidates would prefer UNIZIK to UNILAG. But majority of this candidate are from the five states of South East. In terms of population UNIZIK as at 2015 boast of about 24,706 students under full time programmes while about 12,476 students are under part time programmes, although the management of the university didn’t disclose the number of students under the UNIZIK post graduate school. Please note that the number we quoted above was obtained in 2004/2005 academic calendar. The Nnamdi Azikiwe University, Akwa was founded and established in 1991 and the motor of the institution is Discipline, Self Reliance and Excellence. Is Unizik a federal school? Yes UNIZIK is a federal university, the school is fully funded by the federal government of Nigeria an as such enjoys every benefits and entitlement all federal universities enjoys in Nigeria. Alert: always be on high alert as criminals and fraudsters are out there looking for innocent candidates to defraud their hard earned money.